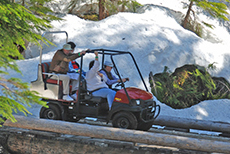 The unforgettable journey on the White Pass Scenic Railway is not just another train ride; built through rugged terrain, the route passes through tunnels and valleys en route to the scenic White Pass Summit. Dog sledding isn't just for the freezing Alaskan winter! 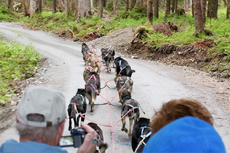 Let a team of strong huskies pull you through Skagway's trails and countryside. 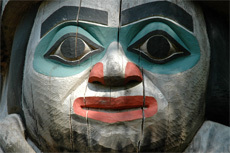 See the remarkable Yukon on a comfortable and intimate guided van tour in Skagway. You will be in awe of its captivating beauty! 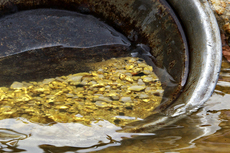 Catch the gold fever searching for yellow nuggets in the heart of historic Skagway. 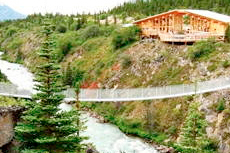 The history and nature of Alaska are on display at the Yukon Suspension Bridge in museum-quality exhibits; cross the custom built footbridge over white water rapids. Nothing beats observing Alaska from the air! Choose a helicopter tour for a bird’s-eye view of Skagway’s spectacular countryside and icy glaciers. 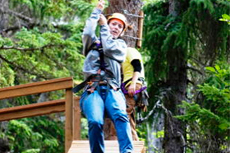 Thrill seekers and nature lovers will enjoy the rush of a zip-line excursion through Skagway's lush forests. 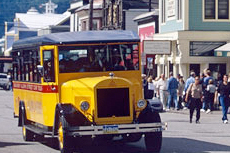 Skagway’s street car, dating back to 1923, is a popular historical tour and mode of transportation to points of interest throughout the Alaska port. Take in the beauty of Skagway with a tour focusing on its rugged culture, stunning scenery, and fascinating history. Pan for gold in Liarsville, a fascinating reproduction of an authentic nineteenth century gold rush-era mining camp. Slide on your sneakers and hike along Skagway's coastline, around its winding trails, and through its forest to enjoy Alaska's natural splendors. You may even catch a glimpse of a bear along the way! 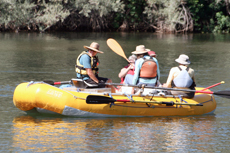 Step back in time as you explore this abandoned, gold rush town on a self-guided walking tour. 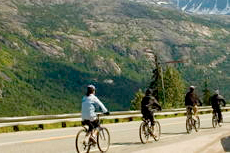 Hop on a bicycle to ride along quiet, scenic city streets of Skagway and glimpse breathtaking views of the Alaska coastline. 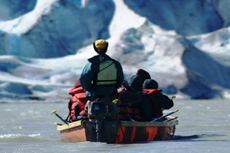 Gear up for a rafting adventure in Skagway; be on the lookout for waterfalls, coves and wildlife. 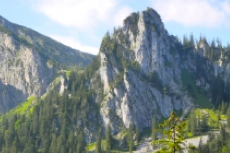 Bring your camera along to take advantage of the magnificent photo opportunities, including crystal clear mountain streams, a cascading waterfall and a scenic alpine lake. You don't just watch professionals on this Skagway glass blowing excursion—have a blast learning how to blow glass yourself! 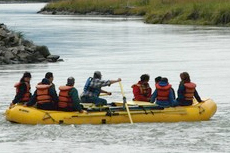 Float down Skagway’s river over gentle rapids toward the Eagle Preserve to observe some of Alaska's finest species. 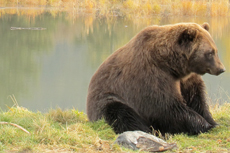 On a wildlife tour in Skagway, you may catch a glimpse of rare bald eagles, deer or even a bear! Bring your camera. 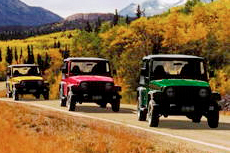 Venture down quiet paths and trails into the heart of Skagway’s natural settings on a Jeep tour. 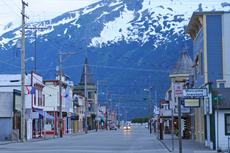 Learn about Skagway's colorful past on a guided historical tour of the city. 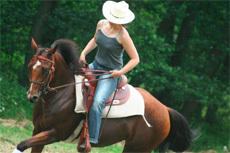 Trot your way through the beautiful wilderness of Skagway on a guided horseback ride. 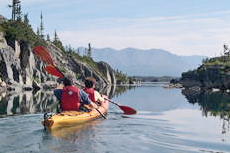 Escape the crowds and explore Skagway’s marine and coastal life on a kayaking excursion through Alaska’s icy blue waters. The whole family will strike gold exploring Skagway's rich history and beautiful scenery on this unforgettable adventure! 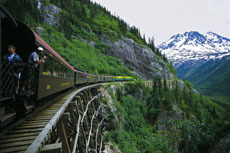 A ride on the White Pass & Yukon Route Railroad. This was created as a result of the Klondike Gold Rush of 1898, though it wasn't completed before the rush ended. 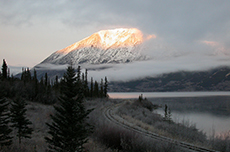 The narrow-gauge train follows the path that pioneers in search of Klondike Gold climbed in order to get to Dawson's Creek in nearby Canada. The tracks wind around granite mountains, trundle across steep gorges and pass through two tunnels. 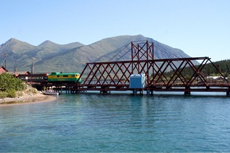 Virtually all visiting cruise lines offer the train ride. Historic walking tour of Skagway. Pick up a map at the Skagway Visitors Center (Broadway between 2nd & 3rd), which, in itself, is distinctive because its builder collected more than 8,800 sticks of driftwood -- and then nailed them to the building's front. 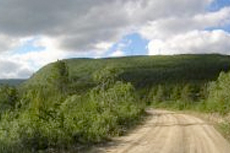 Historic driving tour of Skagway. Fast-talking guides in period garb lead the Skagway Street Car Tour, a two-hour look at the port's Gold Rush history onboard a restored yellow Mac Model B. Learn about the Klondike Gold Rush at the Klondike Gold Rush National Historical Park Visitor Center (2nd and Broadway). Shopping in Skagway. Nestled between totally touristy "outlet" stores and shops full of cheap tchotchkes are veritable gems. For books, try the Skaguay News Depot (Broadway between 2nd & 3rd). The Quiviut Store (in Skagway Bazaar between 5th and 6th on Broadway) sells fine muskox yarns and fibers. The Train Shoppe in the White Pass and Yukon Route Depot (2nd & Spring) has tons of choo-choo souvenirs. Hang out at the touristy Red Onion Saloon (2nd & Broadway), a Gold Rush-era gathering point (and former brothel). 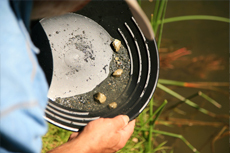 Gold-panning at Liarsville Gold Rush Trail Camp. A stop at this recreation camp, which was set up by press men who were supposed to be reporting from the front lines of the Gold Rush (thus Liarsville), is often packaged with the train tour if you go one way by rail and one way by bus. 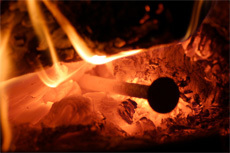 As part of the setup, today's Liarsville also features a campfire, salmon bake and musician playing instruments of the time. The Dog Sledding and Glacier Flightseeing combo tour is a budget-buster, but it's a unique way to experience the glaciers. You'll get a turn at mushing the dog team. 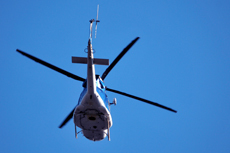 It's available onboard, as well as through Temsco Helicopters (907-983-2900). Take the passenger ferry over to Haines. It's an easy way to go whale-watching and visit the American Bald Eagle Center downtown. Play golf on a nine-hole course set at 60 degrees north latitude. 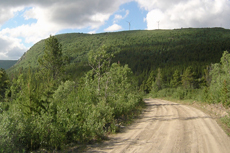 Ride a bicycle downhill along the White Pass Klondike gold route (Sockeye Cycle Co).